February 14 — Valentine’s Day and my mother’s birthday. From the time they were in high school, my daddy bought my mother a heart-shaped box of chocolates every year. And once I was big enough to manage the oven on my own, I baked my mother a heart-shaped cake every year. I loved Valentine’s Day. When my mother was in her 80s, she had some surgery. The day before she was scheduled to go home, she was in good cheer. We gathered in her hospital room and told funny stories, and she was the willing passenger as the teen-aged grandchildren organized impromptu wheelchair races in the hallway. Finally, Daddy sent us all home, cautioning that we would tire her out. A few hours later, she was propped up in her hospital bed watching television. Daddy was holding her hand when she sat forward and said, “Don, there’s that gas pain again.” She fell back dead. The doctors were there in less than a minute, and they did everything they could, but she was gone. When the call came that she had died, I didn’t cry right away. I just couldn’t believe it. How could she be gone? Later the autopsy showed that she had advanced coronary disease. Despite her regular trips to the doctor for check ups and her repeated trips for “that gas pain,” Mother had never been checked for heart trouble. 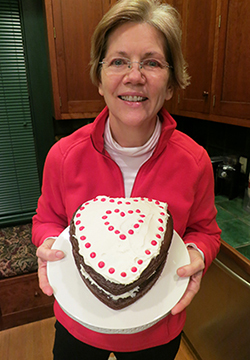 Every year on Valentine’s Day, I still bake a heart-shaped cake. I think about my mother and about the millions of women who have died from undiagnosed heart disease. And every year I email my female relatives and friends and ask them to check out the risks because heart disease kills 1 out of every 4 women in America. I ask the people I love to take care of themselves — and I hope you’ll do that too. But there’s more we can do. Medical science has made great discoveries in the treatment of heart disease, but those discoveries aren’t free. At a time when we’re on the brink of powerful breakthroughs, funding for the National Institutes of Health and other research investments has been strangled. As a proportion of our GDP, the federal government is spending about half what it was spending the late 1960s. When NIH was hit with the sequester that slashed another 5% out of its budget, the Framingham Heart Study — the world’s premier longitudinal heart research project — was threatened. Even now, over 83% of promising research proposals — proposals seeking to combat some of our biggest health challenges like Alzheimer’s, autism, ALS, and diabetes — go unfunded. Young scientists, seeing how hard it is to get their research funded, are beginning to leave research work for other fields where they see a more promising future. I’m fighting to double the investment in NIH. The way I see it, if we invest in first-rate medical research, millions of people will lead fuller lives. Millions of children will have the chance to reach their full potential. Millions of mothers will be around longer to have fun with their grandchildren and enrich all our lives. Double our funding for research. That’s the best memorial I can offer to someone I’ve lost. Thanks for being a part of this, and happy Valentine’s Day!